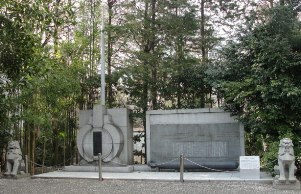 A monument to remember Japanese submarine crewmen who died during the Pacific War was erected in Harajuku District in Tokyo in 1958. The monument stands at Togo Shrine, which is dedicated to Admiral Heihachiro Togo and was built in 1940. Admiral Togo was the renowned naval leader who in 1905 destroyed the Russian fleet at the Battle of Tsushima. 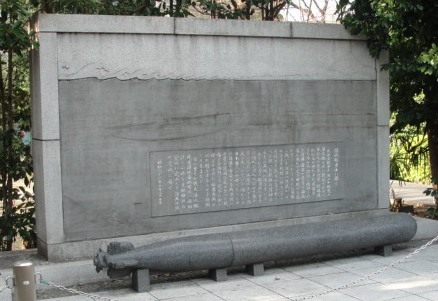 The monument's inscription specifically mentions two types of Navy special (suicide) attack units deployed during WWII: kaiten human torpedoes and midget submarines. There were 106 kaiten human torpedo pilots who lost their lives, including 15 killed in training accidents . There were 436 special (midget) submarine crewmen, including nine men who attacked Pearl Harbor in five midget submarines, who lost their lives in the Pacific War . During the Pacific War, there were over 10,000 submarine crewmen who lost their lives in battle together with over 120 submarines. There were special (midget) submarines and kaiten suicide squadrons. Also, there were some men who died during training. There was no way to collect your remains as you sank deeply to the bottom of the sea. However, the devotion of you men who went to battle during the national crisis remained the same on the battlefield. Your spirit of sacrifice to fight in order to save the country's people from danger will live here forever. We who were connected to submarines that remained, several thousand individuals and organizations in total, gaze at the bottom of the sea where your spirits rest forever. We, along with all Japanese people, hope that this monument may offer spiritual sustenance for the country's recovery as it extends the mournful realization of the reality of your brave figures, scenes of fierce fighting, and battle sites that became filled with corpses in defense of our country. Your former war comrades, persons involved with submarine construction, and other interested volunteers together dedicate this small monument erected in the cemetery of Togo Jinja (Shrine) in order to remember your enduring loyalty. 2. Information on plaque next to Kamikaze Pilot Statue at Yasukuni Jinja Yushukan.